24 bit/192KHz upsampling digital-to-analog converter (DAC) with coax, optical, and USB inputs. Comes with external 12VDC A/C adaptor. This is one of the best upgrades you can make for very little money. The V-DAC is an outstanding value and sounds fantastic -- right up there with DACs in the $1000 price range. Mr. Michaelson might just sell 10 million of these. 1) Vanishingly quiet. It is like staring into the dead of space. There's absolutely no self-noise. 2) Wide and deep soundstage. Stereo separation doesn't get much better. Good ambience retrieval. 3) Tight and authoritative bass. Bass is definitely one of its strong points. 4) Well-balanced sound. Very detailed, not harsh, good presence, but not in-your-face either. 2) Let it burn in -- run music through it for 48 hours straight, at least. 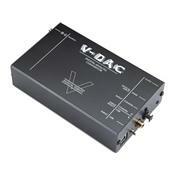 The V-DAC is not as lenient to jittery sources as other DACs, so it behaves best with a good, low jitter source. For example, USB or optical out a computer really degrades its performance. You must let it burn in. Out of the box it seems to lack the slam, transient, and rhythm and pace. Put your CD player on repeat disc mode and play it continuously for 48 hours through the V-DAC. It makes a big difference. After the burn in, it all comes together. You can also get a regulated power supply that others are using, but it's not going to beat a battery since regulated PS still have some ripple. I also tried a high quality switching power supply (A/C adaptor form one of my pro audio devices), and it too sounded very good. About the only area where this DAC is not as strong as I'd like would be midrange warmth, particularly fenale vocals. I've been using a very old Pathos InTransfer balanced out DAC which uses the legendary Burr Brown PCM-63P-K DACs. Compared to the V-DAC, the InTransfer has warmer sounding mids and more vocal presence, but the V-DAC betters it in almost every other way. And that's using the balanced outs of the InTransfer vs unbalanced RCA outs on the V-DAC. Shows you how far technology has come. The InTransfer cost about $3K some 15 years ago. I also have a Bel Canto DAC2 which is a superb in every area. It's hard to believe, but the V-DAC nearly matches the Bel Canto. The Bel Canto is more 3 dimensional, a bit wamer, a bit more detailed. But the V-DAC is quieter and has better bass definition IMO. Pretty amazing considering the Bel Canto DAC2 was a $1500 device. In summary, the V-DAC is simply fantastic sounding, and a literal steal for the money. I bought two demos off eBay for $150 each and I still can't believe it. You will not be disappointed -- just give it time to break in, use a good source, and get rid of the wall wart it came with.